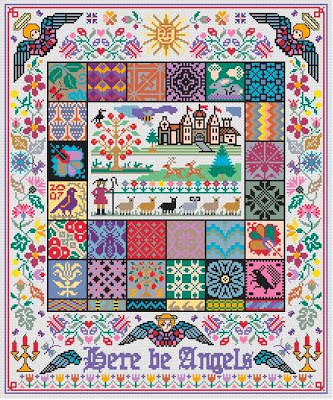 Angel Pavement has been inspired by some traditional Scandinavian samplers which became established towards the end of the 18th century. Typically they featured religious or pastoral scenes although, in more secular examples, the embroiderer might depict such subjects as the house. Frequently images of angels also featured, some holding trumpets while others were embedded within floral borders. The most distinguishing feature of this style was the use of small squares each containing embroidery “aides memoires”.